I'm sure you all already subscribe; but for the benefit of those who haven't noticed yet, the latest Postcripts (26/27: Unfit for Eden) from PS Publishing is out - containing Saving Prince Romero by my good self. Couple of nice reviews for The Alchemy Press Book of Pulp Heroes off Goodreads. Good news: TALES TO TERRIFY has taken Welcome to the Hotel Marianas (originally published in THE BITTER END, Pill Hill Press 2009) for a future podcast. Intriguingly, I’ve been asked if the narrator could be Australian… Well, I don't see why not. And Theresa Derwin has accepted Holding It In for her THERE AIN’T NO SANITY CLAUSE anthology. Fringeworks' AIN'T NO SANITY CLAUSE Psychos at Christmas anthology will be available shortly - containing my own cautionary tale: Holding it In. Ain't No Sanity Clause is now available as a Kindle download - after the usual Amazon-induced delays. An ideal stocking-filler for that special someone. Latest issue of eFantasy now available from Amazon for all you lucky people who got Kindles for Christmas. Obviously -- since I'm plugging it -- it contains a story of mine. Ian Hunter's UNSPOKEN WATER 4 is out now - and I'm pleased to say my contribution -- "Bring Me These Moments Back" -- is in pole position. But we shouldn't forget Marion Pitman, Lee Clark Zumpe, Derek Muk, Rebekah Memel Brown, Brian M. Milton, Richard King Perkins ll, Stephen Palmer, and Andrew Hook. Glad to report that The Midnight Diner 4: Wastelands Under the Sun is now available on Kindle. Always wanted to publish an Italian style Western -- and here it is. 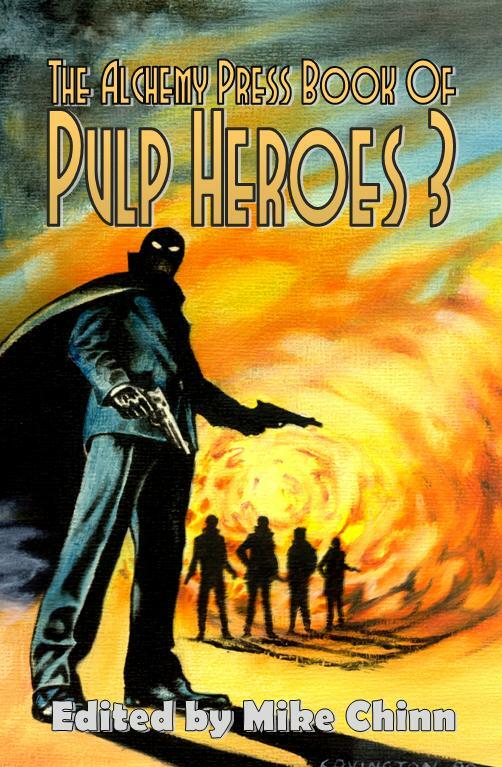 Seen an advance copy of Pulp Heroes 3, and I'm pleased to bits with it. Book to be launched at FantasyCon on Saturday 6th September at 2:00 pm. Contributors are Gary Budgen, Kim Newman, Rod Rees, Iain Grant, Paul Starkey, Evan Dicken, Amberle L Husbands, Tony Richards, Jay Eales, Emma Hinge, Bracken MacLeod and Ralph Sevush. I'm proud to announce that Pro Se Productions will be publishing my new collection of inter-connected Damian Paladin Pulp-style adventure stories in 2016: WALKERS IN SHADOW. Paladin and Leigh Oswin are up against zombies, shape-shifting demons, a decidedly non-twinkly vampire, things from another dimension, and Paladin’s own father. I’ve also been contracted to write a Western, again for 2016 publication. Western movies have successfully mined Japanese samurai films for inspiration; so obviously, I’m using Walpole’s THE CASTLE OF OTRANTO as my muse.